Marvelyn Brown, a 26-year-old native Tennessean, learned she was HIV-positive at age 19. Since then, she has moved both live and television audiences across the United States, Canada, Jamaica, Mexico, the Virgin Islands, South Africa, Tanzania and Rwanda with her compelling personal story. Ms. Brown has spoken at hundreds of colleges, universities, churches and conferences worldwide. Her autobiography, The Naked Truth: Young, Beautiful and (HIV) Positive, was published by Amistad/HarperCollins in 2008. Her humanitarian work earned her a 2007 Emmy Award for Outstanding National PSA, BET's Rap It Up campaign named Brown one of the 25 "HEROES" in the HIV/AIDS epidemic, in 2009 she won the Do Something Award which resulted in her face and story on the back of millions of Nacho Cheese Doritos bags nationwide, and in 2010, she was included in the Heroes in the Struggle photo exhibit by The Magic Johnson Foundation and The Black AIDS Institute. Brown has also made a huge impact on television shows, radio programs and in print media. Some highlights include, appearing on the Oprah Winfrey Show, CNN's Black in America, America's Next Top Model, America's Best Dance Crew, CBS's The Early Show, Anderson Cooper 360, numerous BET's Rap It Up episodes and MTV programming. She has also appeared on the Tavis Smiley Show, the Tom Joyner Morning Show, the Michael Baisden Show, Steve Wilko's Show, as well as the Tyra Banks Show. Articles including her story have appeared in Newsweek, U.S. News and World Report, Fortune 500, Ebony, Black Beat and ESSENCE magazine. She has had a tremendous effect on print in the United Kingdom, and has been featured in Cosmopolitan, Pride and Fabulous Magazine. 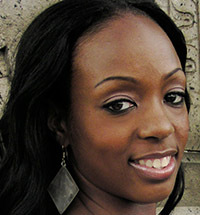 Brown has also graced the covers A&U, POZ and The Ave.
She is currently the CEO and an Independent HIV Consultant for Marvelous Connections, which she founded in 2006. Brown now has an online boutique called MARVSPIRATIONAL, with some of her own inspirational quotes, and she is a proud ambassador for the Greater Than AIDS Campaign.